Karachi, The leading and popular drama serial, ‘Dhoop Kinaray’ of PTV will be telecast in Saudi Arabia. Rahat Kazmi and Marina Khan have performed the leading roles in this drama serial. PTV Drama Serial Telecast in Saudi Arabia. This drama serial was telecast on PTV in 1987 and Haseena Moin is the writer of this drama serial, which got tremendous popularity among the people. It is still considered one of the best drama serials of Pakistan television. 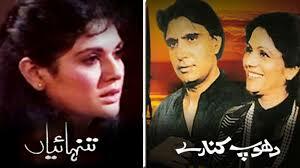 The wonderful performance of Rahat Kazmi and Marina Khan took this drama serial to the height of glory and popularity. Now this drama serial is going to be released in the Islamic brother country, Saudi Arabia. Arab News Pakistan has made the announcement on their social media, Twitter that the drama series, ‘Dhoop Kinaray’ of PTV will be broadcast in Saudi Arabia with the Arabic translation and there will be another drama serial, ‘Tanhaian’, which will also be released in Saudi Arabia. The director of International Relations talked with Arab News and said that two Pakistani soap operas including ‘Dhoop Kinaray’ and ‘Tanhian’ are selected to be aired in Saudi Arabia with Arabic subtitles this year. Federal Information Minister, Fawwad Chaudhary visited Saudi Arabia and he announced that the Pakistani drama serials will be released in Saudi Arabia. This drama serial, Dhoop Kinaray has total 16 episodes and Sahira Kazmi has given the directions of this drama serial, in which Rahat Kazmi, Marina Khan, Sajid Hassan, Qazi Wajid, Badar Khalil and Arshad Mahmood have performed the main roles.